An uncomfortable bike saddle can turn cycling into a miserable experience – and can even lead to long term injuries if you find you’re sitting strangely to accommodate discomfort. The ‘perfect perch’ varies dramatically from one cyclist to the next– and is determined by a number of factors: anatomical differences, riding style and everything in between. The huge variation in what riders need means that there’s a huge amount of choice on offer. It’s finding the one that actually suits you which is the problem. We’ve got a detailed guide to choosing the right saddle for you here, it’s well worth a read before you make your purchase. Discomfort in the saddle varies between riders. But it often arises from a rider settling themselves down on a saddle that is not the correct width. We all have different-width ‘sit-bones’. The ischial tuberosities are the parts of your body designed to bear your seated weight. Most cases of saddle-related discomfort arise because the load is carried on the soft tissues between the sit bones rather than by the bones themselves. Also bear in mind that the perceived width of your rear end has little to do with the actual bone structure. Good bike shops, and some brands, offer test ride programmes so you can try before you buy. Designed to be wide and short, the Power saddle from Specialized will suit a rider who chooses to adopt an aggressive position in the drops. The short length means it’s also ideal for people who tend to stay in one position on the bike. It’s got minimal padding, and comfort is provided by the pressure relief channel. A weight weenies dream at 114g, this saddle will suit a rider who wants a flat, narrow saddle which is comfortable even on longer rides. 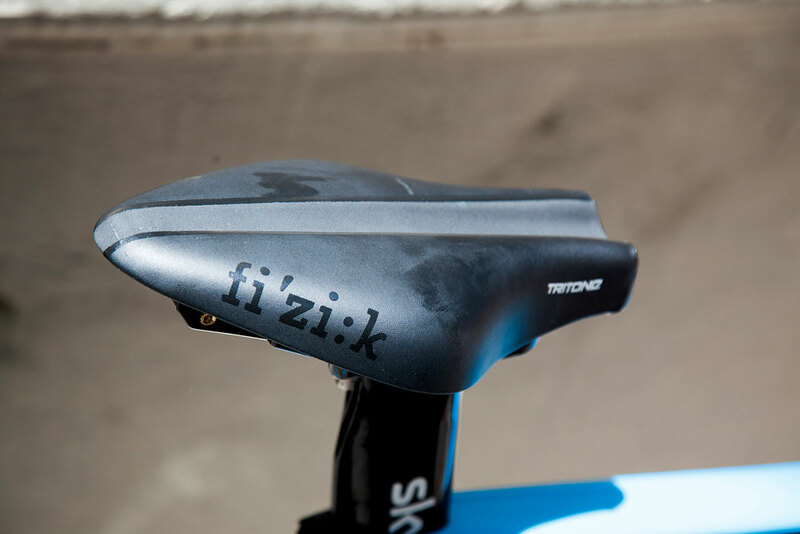 Fizik are famous for catogorising their saddles based upon flexibility and riding style. The Arione is suited to flexible riders and is quite a narrow perch. The length provides plenty of room for a rider to move around, but the width means it won’t suit everyone. Fabric offers low weight saddles, thanks to their unique method of gluing the padding and cover to the base. Their perches come in several styles – the Flat models are ideal for those who sit in a more aggressive position whilst the Shallow versions suit more endurance orientated riders and the Radius is ideal for those in an upright position. A stubby saddle, a lot like the Specialized Power, the Pro Stealth has a wide pressure relief channel that suits riders who like to sit in an aggressive position and stay there. It’s a unisex option that comes in two widths and will suit time trial riders as well as regular roadies. Selle Italia claim that this is the ‘dream saddle of any athlete’ – quite a confident claim! It’s an incredibly light option, and the cut out channel runs almost the entire length of the saddle – making it a good option for those who are often in the drops. A multi purpose saddle that’s suited to everything from racing to touring or mountain biking, this is a fairly wide option with a pressure relief channel and long rails to allow for plenty of adjustment. We rated this saddle as a great option for those planning long, endurance miles. Multi-density foam provides comfort, whilst a pressure relief channel reduces compression. A slight drop at the nose felt great in the drops for our tester, but won’t suit everyone. ISM saddles are renowned for serving time trial riders and track riders particularly well, since the noseless design reduces pressure when in an agressive position. They can work well on the road too. Our tester gave this one 10/10 – though be aware that setting up an ISM saddle will be different to setting up a standard saddle, so check the instructions. Most dealers offer hire options if you want to test one out before you buy. A second one for the time triallists out there, the Mistica is snub nosed and has a tacky surface to prevent you from slipping when sitting on the end in an agressive stance. A pressure relief channel provides comfort for those who find this suites them, too. The rails of a saddle are a frame on the underside, which the seat-post of your bike clamps on to. Most modern bikes conform to the same standard, so any reputable saddle will fit any reputable bike. A Fizik Arione saddle with carbon rails. This is often the saddle of choice for Bradley Wiggins. Rails are one of the main areas that affect saddle price. Entry-level saddles have steel rails, these then move up to manganese, titanium and then carbon. As you move through the materials, they get lighter and more expensive. Carbon rails are the most expensive and lightest. Carbon and titanium are also slightly more forgiving than steel too, allowing for more comfort. The important thing to remember is that the basic steel railed model will often have the same shape as the top end carbon railed version. A common misconception is that more padding equals a comfier saddle. If this were the case the people who spend the most time on bikes, Tour de France riders, would be using very padded saddles. The reality is that padding deforms and creates more contact, so on longer rides it can be less comfortable. Thick, soft padding may initially seem like a good idea to alleviate saddle discomfort, but often a squishy saddle will just compress down under the sit bones and push up in the middle, creating pressure spots in other areas. Can a saddle be too firm though? Some riders (male and female) ride bare carbon saddles and get along fine. This isn’t for everyone, but it does highlight that far more important than padding is shape. To maximise comfort you should aim to get a saddle that is the right shape for your style of riding and sit bones. Shape is the most important aspect of saddle comfort. Saddles come in a plethora of different shapes, designed to support different riders and different styles of riding. Narrower, flatter saddles such as the Fizik Arione tend to suit more aggressive riders with a lower position (such as Bradley Wiggins). The Specialized Romin is another example. Bradley Wiggins has a very flat back and aggressive position and favours a flat and narrow saddle. A slightly wider saddle with a curved profile, such as this Fabric Scoop, is often the choice of riders who sit more upright. The Fizik Aliante and Specialized Toupé are also examples of saddles designed for a more upright position. Many bike shops have what we like to call ‘bum-ometers’ (we just made that up). These are devices that you can sit on and feature a memory foam. Your sit bones leave an impression in foam, the width of which can be measured. A general rule of thumb is that the saddle width should be sit bone width +2cm. Specialized and Bontrager both produce devices like this to measure your sit bones and these are often available to try in your local bike shop. So you’ve measured your sit bones, you’re happy that your saddle is flat enough and the padding is good, but you still feel discomfort. The solution? You may need a cut-out. Saddles are available in a range of cut-outs and relief channels that come in different sizes. The best way to see if you’ll benefit is to try one. Cut-outs and channels can relieve stress on soft tissues in your delicate areas. If you repeatedly experience discomfort this might be for you. Some bike saddles feature relief channels. This is an alternative to a full cut-out and is very popular with some people. Is it bad to have a cut-out if you don’t need one? Many people who don’t need a cut-out comfortably ride saddles with cut-outs with no problems. However, some people find that cut-outs can increase pressure at the edges, or pinch delicate skin. Riding in a time trial position requires most riders to be ‘on the rivet’. This can mean the rider has a forward rotated pelvis, with the sit bones typically up, off the saddle surface. Consequently the pubic bone and other soft tissues become weight bearing. Triathletes and time trialists tend to favour special saddles that have effectively had the nose chopped off, such as the Fizik Tritone. This also enables pro-riders to set the saddle further forward on the rails, as there is a current (arguably outdated) UCI rule that limits how far forward the nose of the saddle can go. Finding the perfect saddle for you can take a little work. First: try to determine what it is you don’t like about an existing saddle – are there key aspects that don’t seem right? If so – use those to determine what you do want from a saddle. Riders who often sit in an aggressive position often want a pressure relief channel, whilst those who desire the freedom to move around a lot will favour a longer nose. Next: shop around, look for models that are suited to your style of riding, level of flexibility and anatomy. Ideally, seek out brands that offer a proper fitting process such as the Selle Italia ‘idmatch’ you’ll find in all stores that stock their models. Alternatively, hunt out the brands that offer test saddles from dealers: Fizik and ISM both provide this service. Any returns policy on offer is important, too – some companies will allow you to try buy a saddle and swap it for another if you are not happy with it within 30 days. This is very useful for trying a few out. Remember: changing your saddle can change your saddle height. If you get a new saddle, it is worth reassessing your saddle height. It’s also a good idea to check that the saddle is sitting at the correct position on the rails – getting this wrong can cause discomfort elsewhere, such as knee pain. Hopefully it goes without saying, but the shorts you’ll wear on the bike make a differance to your overall comfort, too. If you are regularly suffering from discomfort on the bike, make sure that you’ve invested in a good quality, properly fitting pair of cycling specific shorts before you blame the seat. And when you try a saddle don’t wear a pair of jeans!